Alexandria Ocasio-Cortez spent Wednesday evening drinking wine and talking to her followers on Instagram Live. 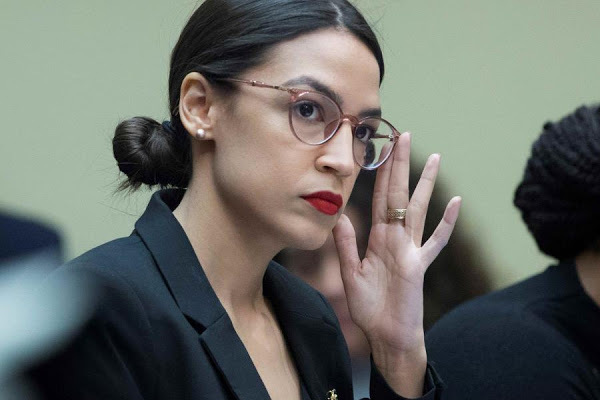 In the online “look at me” session, the self-proclaimed democratic socialist said that she could only pity those who mock her Green New Deal. “We have twelve years left to cut emissions by at least 50%, if not more, and for everyone who wants to make a joke about that, you may laugh, but your grandkids will not,” she warned. “So, understand that the internet documents everything. You know, you want to look about, you want to talk about looking at the back of history, looking backward? Yes, because Klan protesters during the Civil Rights Era are comparable to anyone today who expresses the idea that you’re an idiot, Alex. We hear this argument from time to time from leftists criticizing conservatives who are “standing in the way of progress,” and we just have to do our own laughing. Does it never occur to them that sometimes – just once in a while – their ideas of progress are actually nothing of the kind? No, we know that it never occurs to a birdbrain like AOC, but no one else? Really? Okay. “So just know that in the present day there a lot of people who hide the fact that their families and that their grandparents fought against principles of equal rights in the United States. Not 100 years ago, not 80 years ago, but in this generation’s lifetime,” she said. “So just know that while a lot of people can hide that their grandparents did that in the civil rights movement, you should also know that the internet documents everything. And your grandchildren will not be able to hide the fact that you fought against acknowledging and taking bold action against climate change. “And for those of you who are trying to mock and delay this moment, I mean, I just feel bad for you. I pity you for your role in history right now,” she concluded. Somehow, we’re not all that concerned. If history shows that we were on one side and Alexandria Ocasio-Cortez was on the other, we’ll be just fine with that.